On July 27th, Maurice Steger is once again a guest at the Klosters Music Festival. In the opening concert, he performs with the Baroque orchestra La Cetra from Basel through a varied program with works by Handel, Sarro, Telemann, Montanari and Sammartini. His well-thought-out programs, in which he pays tribute to some of the great baroque masters as well as unknown composers, keeps his concerts both meaningful and entertaining. 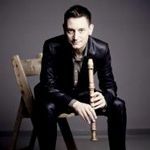 The fact that his instrument, the recorder, is in no way inferior to other wind instruments, has been proven countless times throughout the world by Maurice Steger with his breathtaking virtuosity and musical narrative skills.